« Can you retire before 40? Why are your posts always so damn complicated. You keep posting numbers and graphs, but I’m not a numbers girl, unless of course you’re cute in which case my number is 555… Why don’t you come out with some financial advice for dummies like me? I want finance de-complicated. The names Blonde, Jane Blonde. Good call miss Blonde. You know, I think this whole industry is built around making people believe finances are only for accounting nerds, or worse, actuaries, but to be quite honest, there’s nothing complicated about it at all. In fact, I’m pretty certain that all the experts and snake oil salesman specifically designed it as a giant smoke screen to keep you thinking it’s complicated so they can keep their high paying jobs, six figure bonuses and holiday homes in Umhlanga, all thanks to the money they take from us while we’re not paying attention. Mark my words, the only interest the majority of financial product sales people have in your wealth, is in how much of it they can transfer to themselves as fees for a service probably badly rendered. Rule 1) Stay out of debt. Rule 2) Spend less than you earn. Rule 3) Invest the difference. That’s all there is to it. Do those three things and you’ll be perfectly fine. It doesn’t have to be any more complicated than that, unless you choose for it to be. So how about we can flesh those topics out a little. 1) No debt, ever! Okay maybe a home loan, but generally not even that. If you’re paying off debt, you will NEVER get ahead. It’s simply impossible. You can’t be investing in a fund hoping for a 15% return when you’re paying off credit card debt which has a 21% interest rate. That’s like trying to run up the down escalator, in roller skates. Repeat after me, “I will stay out of debt. A car payment isn’t normal, even if everyone else has one”. Dad was right, if everyone else jumped off a bridge would you do it? How we’ve gotten to a point in our society where it’s perfectly acce ptable that everyone has a car payment, credit card debt and store accounts is really a mystery to me. Go ask your grandparents which bank financed their first car loan, whether they had a Mastercard or Visa in their wallets when they were young, or how many months they had to make payments on their first fridge. I’m guessing you’ll find they didn’t have any of those. They simply saved until they could afford something, and then went out and bought it. So why is it that we now have an extra 60 years of experience, exponentially better education, billions of websites filled with knowledge and higher incomes (yes, even when inflation adjusted) than the world has ever seen, yet we’re making mistakes that people two generations ago would have laughed at us for. To quote the wise Mr T: Stay out of debt you fool! 2) Spend less than you earn. Truly rocket science! I can’t believe I’ve just written that in a personal finance blog. It’s so ground breaking that even entire countries get it wrong, when was the last time you heard a finance minister talking about a budget surplus rather than a budget deficit? Even if someone is smart enough to stay out of debt, they’re still likely to be spending everything they’ve got, every month. Sadly in most cases the average person somehow thinks it’s perfectly fine to spend all your income, and your overdraft and credit limits, every month. Then when your next paycheck arrives you make the minimum payments, and start all over again. So what are you supposed to do? Well first read rule one and make sure you follow that. With that done, you’re still not going to get anywhere unless you can spend LESS than you earn. How much less? Well that’s up to you. As we saw in “The only way to get rich“, saving 50% of your take home is enough to only have to work 17 years. And it should be simple if you’re not throwing all your money after debt repayments. Here’s the table again for your reference. 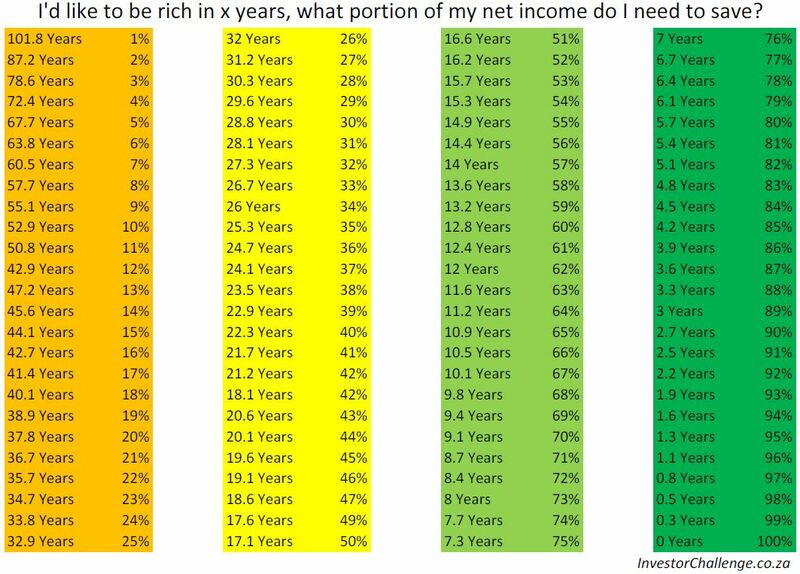 As you can see, even if you are planning on a regular 40 year long working career, you should still do whatever you can to put away 18% of your income. This can be a combination of your company pension, plus your tax free savings, plus any other investments you’d like to make. If you’re struggling, take a look at what you are spending your money on, and make some cuts. A little goes a very long way. Ideally though, you’ll save more. Either because you want to retire early, or just because working is so much better when you have a decent pile of F-You money. A good strategy to take is to come to a point where your life is pretty comfortable, and then whenever you get an increase or a bonus, pretend it doesn’t exist and keep living your comfortable life while saving extra income. 3) Invest the difference. So you’ve got points one and two well sorted, now is the time to put your money to work. This is where compound interest comes to the party. And just in case you’re wondering, saving is not equal to investing. I’ve always been a great saver, sadly for the first 7 years of my working life, all I did was save in my bank account. After that I started investing rather poorly in property, before moving on to the big daddy of investment vehicles, index funds, just a few years ago. Had I been investing in those funds since the beginning, I would have been way past my goal of what I consider enough to never need to work again. I could go into all the numbers again, but unless you have some sort of special talent for property or business investments, you’re simply better off throwing every spare cent into the stock market. If you’re employed, ask HR about your company retirement annuity. If you haven’t already got a tax free savings account, get one. ABSA stockbrokers looks the best for those (edit: No they changed their fee structure far too many times, I can’t recommend them anymore, rather go to Easy Equities), charging just 0.25% in fees. If you’ve maxed out your RA, and put R33k into your tax free savings account every year and you still have some money left over then it’s time to open a regular brokerage account. In this case Easy Equities is the best, as they have the lowest fees, and more importantly, no minimum investment. 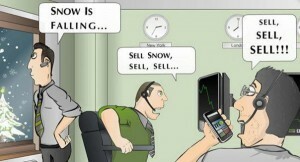 Open an account with them, and then start looking around at all the different ETFs (exchange traded funds) available. It won’t take much reading to decide which ones you like. Incidently, my choices at the moment are the Satrix Indi, and the Coreshares Dividend Aristocrats. You might prefer something else. The key issue is to keep costs low, and by being smart and avoiding unit trusts in favour of ETFs you’ll be doing just that. Then end. If anyone tells you anything else is particularly important, you can most likely ignore them pretty safely. In fact, this is one of the few cases where more knowledge often means worse performance. Ignore terms like derivatives, support, crashes and the like, and the only thing you need to know about bears and bulls is that both are best avoided in the wild. Still too complicated? Ok, I’ll make it even easier, do you like the beach? It’s a balmy morning on Margate beach. You’ve had a great walk, making sure to step over the drunk teenagers sleeping off their matric holiday hangovers, and now it’s time for a swim. Being a Vaalie, you don’t really know much about the sea, so you stupidly aim for an area off the beach where the waves were far lower than everywhere else, so you can swim peacefully. Sadly what you don’t know is that when all the water crashes onto the beach, it has to find somewhere to get back out to see, and since you’re in that area, you’re heading out to sea with it! This is called a rip current, or in financial terms, debt! If you’re lucky, you would have watched that episode of Baywatch and paid attention to something other than the bouncy running scenes, so you’d know that swimming back to shore while you’re still in the current is impossible, you first need to escape the current, or in this case, get out of debt! To do so, you have to swim sideways, rather than back to shore, ie. pay off your debt before you try save. But escaping the current isn’t enough, now you need to get back to shore. Treading water isn’t good enough, you will have to put in some effort. In money terms, now is the time to save. An even smarter move would be to use the momentum of the waves to help take you back to shore. Surf a few big waves and you won’t even have to swim anymore. Again to translate it to money, your invested money will earn you more money, until it gets to the point that you don’t even need to do anything.